The issue, of course, is that markets are no longer anchored by previous certainties. Companies and investors clearly cannot avoid taking a view on the issue. And the difference between the forecasts is vast in terms of future profitability. One way to resolve this impasse might be to test strategies against the 3 Scenarios I proposed in my 2015-17 Outlook last November, Budgeting for the Cycle of Deflation. This could help avoid the risk of an unpleasant surprise in the future. The bursting of the US energy bubble is looking more and more like a replay of the sub-prime bubble in 2008. So what happens now that the bubble is bursting? As with the sub-prime bubble, we cannot yet know for certain how deep the problems run. 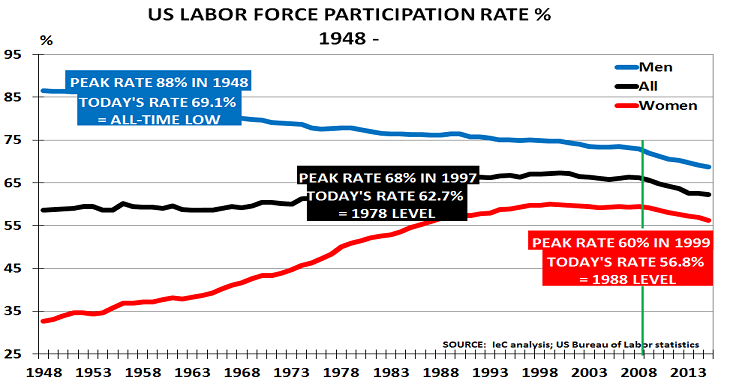 But we do know the participation rate (the number of men and women working, as a proportion of the adult population), is already at its lowest level since 1978. And we also know that jobs in the oil/gas industry are now starting to disappear quite quickly as the bubble bursts. December’s near 1% fall in US retail sales is another worrying sign that all is not well in the wider economy – which is 70% dependent on consumer spending. Of course, we also know that the wishful thinkers, as in 2008, will keep telling us that “everything is for the best, in this best of all possible worlds”. And we all know how wrong they were, then. Financial markets today only care about one thing – whether central banks will continue to provide more low-cost financing to support higher asset prices. Thus markets liked last Friday’s weak US jobs report. They hoped that the US Federal Reserve would slow its tapering process as a result. This inverted logic explains why bad news for the real economy is seen as good news for financial markets. Blacks are 14% of the US population, and Hispanics are 17%. So this racial divide in the jobs market makes it most unlikely that employment can quickly recover. Similarly, low educational attainment cannot be changed overnight. This, of course, is why it makes no sense for the Fed to think it can boost employment via the use of monetary policy. Printing more money, or keeping interest rates low, will not change unemployment rates for Blacks and Hispanics. Nor will they magically provide a college or bachelor’s degree for those who left high school without a diploma. Sadly, today’s politicians prefer to avoid hard conversations with the electorate about these structural issues. That would mean real debate, not sound-bites and Twitter-feeds. Instead, they are happy to shift the headlines to central banks. But, of course, this hands-off approach does nothing for real investors, wanting to think beyond the next quarter. Nor does it help real companies to invest in growing markets for the future.